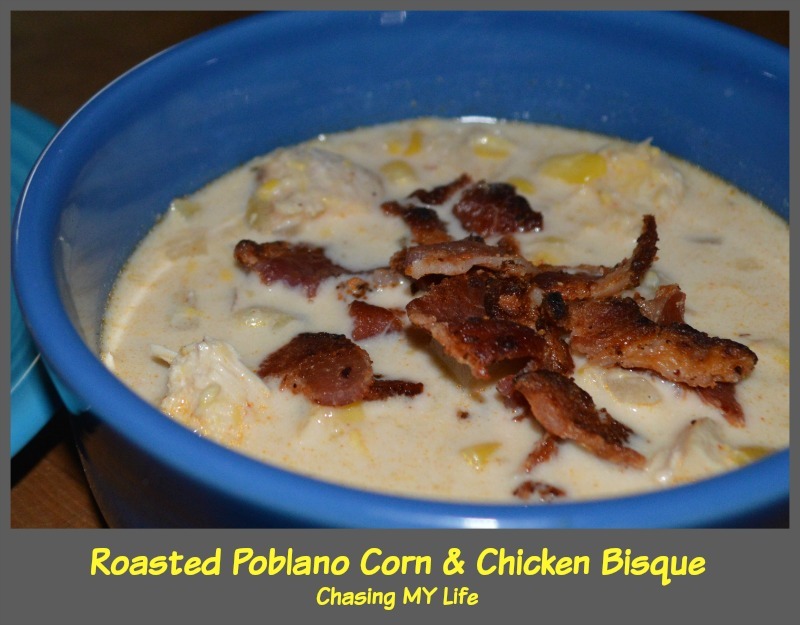 I love Escalante’s Roasted Corn Bisque – Fresh roasted corn, poblanos, bacon, grilled chicken, and onion in a sherry wine bisque and have been working to duplicate it. I think I have FINALLY accomplished it! Cut Poblanos in half and remove seeds. Place cut side down on a lightly greased baking sheet. Spray Poblanos with non-stick cooking spray and roast for 8-10 minutes or until skins begin to blacken. Add onions and garlic and cook for 3-5 minutes or until tender. Dice roasted Poblanos in to small pieces and add them to the pot along with chili powder and cumin, cooking a few minutes longer. Simmer about 10 minutes, or until potatoes are just tender. Puree’ about half of the corn and potato mixture. Add puree’ mixture back into pot. In a small bowl, whisk together the half and half, remaining 1/4 cup broth, the sherry, sour cream and 4 tablespoons of flour. Whisk the cream mixture into the soup until smooth. Simmer for 5-10 minutes to allow soup to thicken. Stir in the crumbled bacon and cilantro. Serve with optional toppings, if desired.